UCLA -- Pro-labor policies pushed by President Herbert Hoover after the stock market crash of 1929 accounted for close to two-thirds of the drop in the nation's gross domestic product over the two years that followed, causing what might otherwise have been a bad recession to slip into the Great Depression, a UCLA economist concludes in a new study. "These findings suggest that the recession was three times worse — at a minimum — than it would otherwise have been, because of Hoover," said Lee E. Ohanian, a UCLA professor of economics. manufacturing wages fell 30%. GDP, meanwhile, only dropped by 4%. The findings are slated to appear in the December issue of the peer-reviewed Journal of Economic Theory and were posted today on the website of the National Bureau of Economic Reasearch as a working paper (full paper here). Hoover's approach is unlikely to be considered today as a means of responding to economic crisis, but it does illustrate the perils of ill-conceived government policies in times of economic upheaval and confusion, says Ohanian, a macroeconomist who specializes in economic crises. Originally posted at Carpe Diem. The table above (click to enlarge) is based on PSAT scores in 2008 for college-bound juniors for males and females taking the mathematics exam, showing the results for the five geographical regions of the U.S. For both males and females, the highest scores were in the Midwest states, similar to the findings for the SAT test results, reported yesterday on the NY Times Economix blog, "Why The Midwest Rules on the SAT." The results also show a significant gender gap in favor of males for the mean math test scores in all five regions, with mean male test scores ranging from 3.2 points higher in the Midwest (52.2 for males vs. 49 for females)to a low of 2.5 points higher in the South (50 points for males vs. 47.5 for females). In all five regions, the standard deviation of male test scores was higher than the standard deviation of female test scores, confirming previous findings of greater variability in male intelligence/scores on standardized tests. 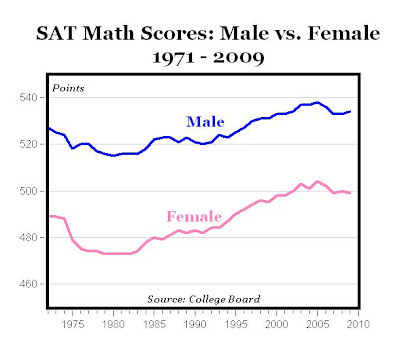 Male high school students also outperform female students at the highest level of math test performance, i.e. in the range from 75-80 points. For example, 1.6% of male juniors in the Midwest score above 75 points, vs. only 0.50% of female students, for a ratio 3.2 males to 1 females for test scores in the highest range (see last column in table above). 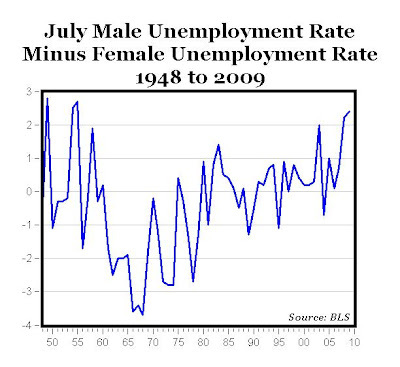 The M:F ratios for scores above 75 range from a low of 2.11 males per female in the New England states to 3.2 males per female in the Midwest states. At a 1978 lecture, Milton Friedman talks about government spending and explains one of the greatest economic fallacies of all time, essentially another version of Bastiat's "broken window fallacy." Peter Schweizer: Michael Moore is constantly trying to prove his and the Left's moral superiority, so he says things about himself that are patently not true. He's pathological about it. How else to explain that he's loudly proclaimed no less than three times that he doesn't invest in the stock market because it's morally wrong while quietly picking up shares in a whole host of companies. A portfolio that includes Halliburton, Boeing, and HMOs doesn't fit the bill so he lies about it. I think he assumed that no one would poke around and investigate. When it comes to the MSM he was correct in making that assumption. He never responded to my questions. I'm dying to know how he explains away this one. Moore professes to hate capitalism ("the last evil empire" he's called it) but practices it in spades. Moore condemns people for their racism and claims to support and practice affirmative action, but has a lousy record of hiring minorities. He outsources post-production film work to Canada so he can pay non-union wages. I could go on and on. I would ask his fans: is this really a sincere person? Era of Citing Adults for A Victimless Crime Is Over? DENVER - A city panel in charge of overseeing marijuana possession crimes in Denver recommended on Wednesday that the fine for possession be set at $1. If Denver's presiding judge accepts the recommendation from the Denver Marijuana Policy Review Panel, the fine would be the lowest in the entire nation for marijuana possession. 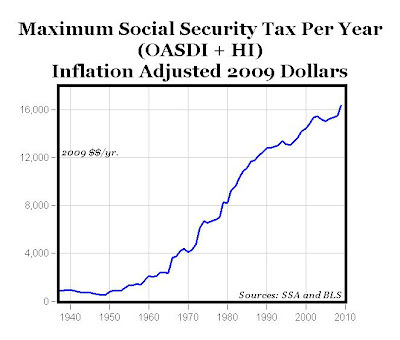 The chart above is based on Social Security Administration data here for maximum taxable Social Security earnings, and here for the tax rates for Social Security's Old-Age, Survivors, and Disability Insurance (OASDI) and Medicare's Hospital Insurance (HI), and shows the maximum annual taxes payable from 1937 to 2009. The annual tax amounts have been adjusted for inflation using the CPI data available here, and are shown above in 2009 dollars for the total annual contributions that come from both employees (50% of the total) and employers (50% of total). Note that since 1970, the maximum taxes paid annually for Social Security and Medicare has more than quadrupled from $4,000 to more than $16,000. Those were not the words of Senator Edward Kennedy. The speaker - in December 1962 - was President John F. Kennedy (see video above), and his ringing call for tax cuts was no anomaly. "You tell me the rules and I’ll tell you what outcomes to expect." How Long Does A Top Athlete Work For $100,000? According to the latest figures from the U.S. Census Bureau, it takes an average U.S. citizen a shade under four years to earn $100,000. Alex Rodriguez does it in six pitches. Ben Roethlisberger of the Pittsburgh Steelers may have him beat. If you include his signing bonus, Mr. Roethlisberger brought in 100 grand for every 3.6 snaps he took in 2008 (many of which were hand-offs). But at least he helped his team win a Super Bowl. Cleveland Cavaliers forward LeBron James played 3,054 minutes in the 2008-09 regular season and made $100,000 every time he passed the 21.2 mark. 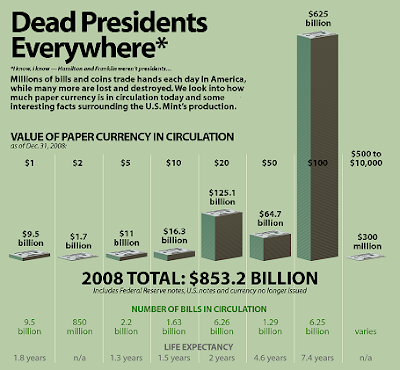 Note the difference in life expectancy between $1 bills (1.8 years) and $5 bills (1.3 years, less than the $1 bill) and $100 bills (7.4 years). Listen to bluesman Little Walter sing about them "Dead Presidents." The machine pictured above was hailed as the 'future of weather prediction' with the ability to produce more accurate forecasts and produce climate change modelling. However, the Met Office has now been named as one of the worst buildings in Britain for pollution - responsible for more than 12,000 tons of carbon dioxide a year. 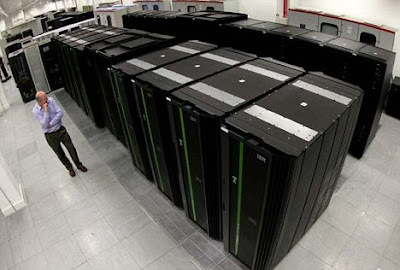 It says 75% of its carbon footprint is produced by the super computer, meaning the machine is officially one of the country's least green machines. Green campaigners say it is "ironic" that a computer designed to help stave-off climate change is responsible for such high levels of pollution. BUSINESS WEEK -- Consider iQor, a call center and business process outsourcing company based in Columbus, Ohio, that's increased revenues at a 40% clip for the past four years. 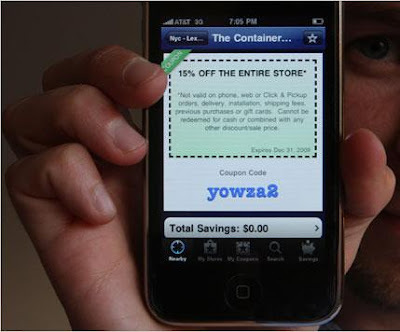 It's done this primarily by expanding its U.S. operations. IQor also gives its U.S. employees universal health insurance, and pays salaries and bonuses that are nearly 50% above industry norms. Call centers and back-office work in all but the most specialized areas have been rapidly moving off U.S. soil. iQor, on the other hand, has 12 locations in the U.S. that house nearly half its 11,000 employees, including in such all-American cities as Columbus, Buffalo, and Greensboro It also has operations in Canada, India, the Philippines, and U.K. The best of iQor's front-line call-center workers make more than $100,000 per year, and that's not a typo. During the past four years, iQor added nearly 3,000 jobs in the U.S., making it the company's fastest growing region. COLUMBUS, OH, August 10, 2009 – iQor, Inc., a global provider of business process outsourcing (BPO) services is continuing to hire Agents at its Columbus Center of Excellence. Current plans include hiring as many as 100 Agents in the next two months. The Columbus Center now has over 800 employees. MP: Despite the U.S. recession and a worldwide economic slowdown, here's an example of a successful U.S.-based company that has continued to expand its global operations, especially in the U.S., and has continued to hire American workers at attractive salaries during "the worst economy since the Great Depression." Isn't this just the epitome and apotheosis of "consumer greed?" UK Telegraph -- We have all become so used to reading that the end of the world is nigh that we tend to close our eyes and stick our fingers in our ears when there is evidence to the contrary. So you have probably missed one of the biggest pieces of good economic news to emerge recently: energy prices are coming down, in some cases to record lows. Furthermore, even if prices start to recover, they are not likely to return to the ridiculous levels of 2008 any day soon. This is excellent news, of great import. The trend for gas and electricity bills is downwards; diesel is back at the same price as regular gasoline; the world is practically choking on natural gas, and is potentially awash with oil. The main international natural gas price has this week fallen to a record low, due to a surplus of new resources from North America (see chart above). Even the stubbornly high oil price has dropped. How come natural gas prices have fallen so much? To understand why, you need to get up to speed on the exciting phenomenon of so-called tight gas. This, after coal, could perhaps be the world's most prolific energy source. Hitherto, we have relied on conventional deposits of natural gas. But tight gas is locked into difficult rock formations, such as shale, and in the past couple of years the industry has found low-cost ways of fragmenting those rocks in order to get at the gas, particularly in America. The result is that US gas reserves have effectively doubled, almost unnoticed; and the same technology can be readily applied in Canada, Australia, Asia and even parts of Europe. As we go into the autumn, US gas storage units are almost full to bursting. Facilities once designed to import are being turned around for export. When it comes to gas, America is the new Russia. And for the rest of the world, tight gas equals one thing: freedom. How has this amazing development come about? Well, my friends, it is the market at work. The high prices of the past decade incentivized a scramble for new technology and projects which are now producing. An era of cheap and abundant energy will be a much-needed tribute to the unfashionable virtues of markets, free trade, and capitalism. 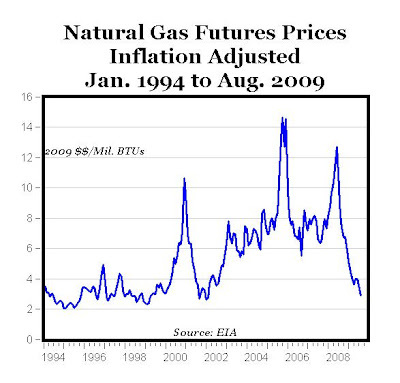 MP: As the chart above shows, inflation-adjusted natural gas prices have fallen by 80% since the peak in 2005, and are now close to the prices that prevailed in the 1990s. In addition to the significant benefits of falling natural gas prices, another advantage to natural gas is that there is "no OPEC cartel to dominate it," as the article points out. NEW YORK -- If you thought school spirit meant just plastering your college bumper sticker on your car, think again. 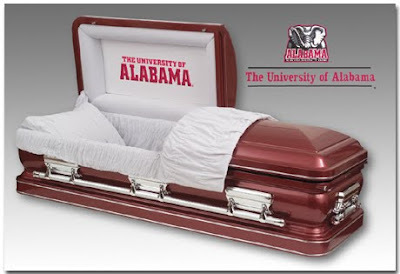 These days, devoted alumni and fans of their college team can show their undying school spirit — in a college-themed casket. "I don't think any of us can deny the experience education has played in our lives," said Scott Walston, president of Collegiate Memorials, which sells the caskets for 46 schools throughout the country. "When families choose the casket, they're setting the stage to conjure up memories to celebrate who the person was." WSJ -- Walgreen Co. will offer prescription drugs directly to Caterpillar Inc. for workers and retirees starting Jan. 1, expanding an unusual approach to cutting corporate health-care costs and improving efficiency. When Caterpillar is buying drugs, the agreements will allow it to bypass pharmacy benefits managers, or PBMs, the managed-care companies that most large employers use to administer prescription-drug programs for employees. Caterpillar will negotiate pricing directly with Wal-Mart and Walgreen instead of paying a PBM to handle that part of the business. Savings will come through lower prescription drug costs for Caterpillar. The Caterpillar approach, which comes at a time of heightened uncertainty about the future of health care in the U.S., could serve as a template for other large companies to manage their drug plans in more cost-effective and transparent ways. MP: Another example of how competitive market forces, not government intervention, result in lower health care costs. 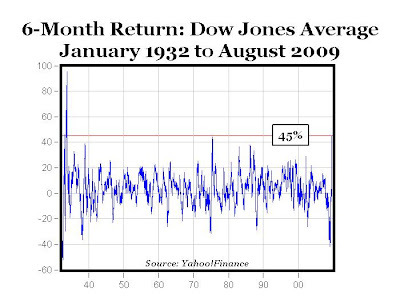 From the early March lows, the Dow Jones Industrial Average has seen a spectacular rise of about 45%, marking the best six-month stock market rally since January of 1933 (see chart above). ECRI: Double-Dip Recession "Out of the Question"
NEW YORK (Reuters) - A weekly measure of future U.S. economic growth slipped in the latest week, though its yearly growth rate surged to a 38-year high that suggests chances of a double-dip recession are slim. The Economic Cycle Research Institute said its Weekly Leading Index for the week to August 21 fell to 124.4 from 124.9 the prior week. 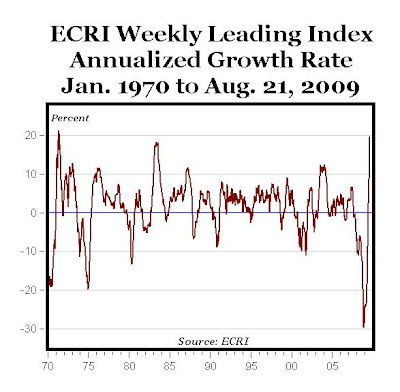 But the index's annualized growth rate soared to a 38-year high of 19.6% from 17.4% the prior week. It was the WLI's highest yearly growth rate reading since the week to May 28, 1971, when it stood at 20.5% (see chart above). "With WLI growth continuing to surge through late summer, a double dip back into recession in the fourth quarter is simply out of the question," said ECRI Managing Director Lakshman Achuthan, reinstating the group's recent warning to ignore negative analyst projections. Achuthan has recently projected that the recovery is moving at a stronger pace than any the United States has seen since the early 1980s. FORTUNE -- For drivers who already share movies via Netflix and stream music rather than buying CDs, the idea of sharing a car is the natural extension of a hip, financially smart, and environmentally conscious urban lifestyle. You can now find Zipcars in most major U.S. cities, including Seattle, San Francisco, Atlanta, Chicago, and New York, and in college towns like Ann Arbor and Chapel Hill, as well as in Britain. Perhaps the clearest indication of how big the car-sharing market could become is the entrance of rental giants such as Hertz (HTZ, Fortune 500), Enterprise, and U-Haul. Hertz launched a service in December in New York, London, and Paris that freely copies Zipcar, right down to the forest-green tones of its website and emphasis on a caring "community" of users. Compared to Canada, The U.S. Has Way TOO Many Banks: Bank Failures Might Be Good for the U.S.
With more than 8,000 banks, does the U.S. have too many banks? The comparisons to Canada below provide some perspective. According to Wikipedia, Canada has a total of 72 banks, and that number is very high by historical standards. From 1920 to 1980, Canada had only 11 banks. By May 2006, that number had increased to more than 60 in the wake of regulatory changes permitting the entry of foreign competitors. 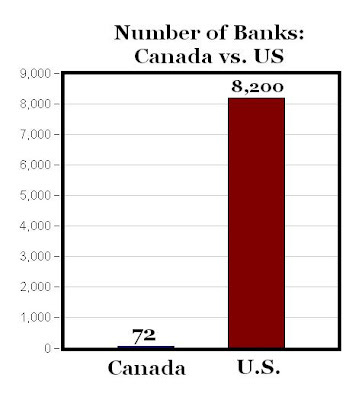 In contrast, the U.S. currently has almost 8,200 banks, or about 114 banks for each one bank in Canada, see chart below. 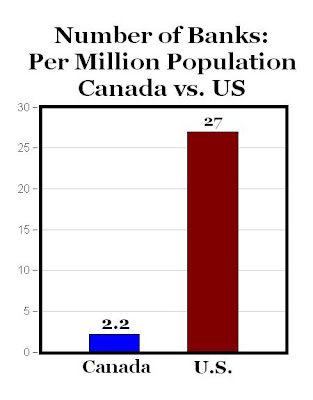 Of course, the U.S. population (304 million) is much higher than Canada's (33 million), so the chart below shows the number of banks per million persons in each country, and the population-adjusted number of banks in the U.S. is still more than 12 times larger than Canada (27 banks per million in the U.S. compared to 2.2 banks per million in Canada). Bottom Line: Maybe the U.S. has too many banks, and the recent bank failures are a positive development for the U.S. economy and banking system. Weak, failing banks can't facilitate the flow of credit in the economy, and the banking system is better off without those banks. Keep in mind that the assets, loans and deposits don't disappear when a weak bank fails, those assets, loans and deposits are usually taken over by a larger and/or stronger bank. 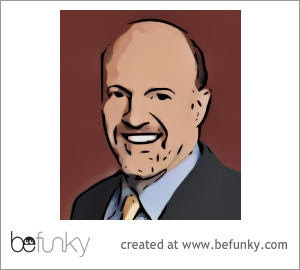 See the FDIC's list here of the 81 banks that have failed in 2009, and notice that in every case the deposits were assumed by another bank, and in most cases either all or most of the assets of the failed bank were purchased by the acquiring bank. It should also be noted that in most cases the assets/loans of the failed bank actually exceed the value of the deposits, although it's not clear how those assets are valued. Even if we lost another 1,000 banks as some are predicting, we would still have more than ten times the number of banks in Canada, adjusting for the differences in population. We should welcome, not resist the forces of Schumpeterian creative destruction in the banking system. Nick Gillespie, Reason Magazine -- The legislation for which Ted Kennedy will be remembered is precisely the sort of top-down, centralized legislation that needs to be jettisoned in the 21st century. Kennedy was in fact a man out of time, a bridge back to the past rather than a guide to the future. His mind-set was very much of a piece with a best-and-the-brightest, centralized mentality that has never served America well over the long haul. Bigger was better, and government at every level but especially at the highest level, had to lead the way. In an increasingly flat, dispersed, networked world in which power, information, knowledge, purchasing power, and more was rapidly decentralizing, Kennedy was all for sitting at the top of a pyramid and directing activity. In this way, he was of his time and place, a post-war America that figured that all the kinks of everyday life had been mastered by a few experts in government, business, and culture. All you needed to do was have the right guys twirling the dials up and down. As thoughtful observers of all political stripes have noted, this sort of thinking was at best delusional, at worst destructive. And it was always massively expensive. 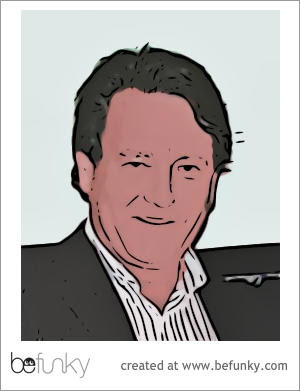 Alan Bock (via Cafe Hayek) -- In the hoopla over the death of Ted Kennedy a good deal of nonsense is being spewed about the nobility of "public service." Ted spent his entire life in public service -- he never had a private-sector job nor did he need one, given the money he inherited. So we are supposed to be grateful that he spent his whole life serving others. No doubt he saw it that way, but the only way a politician can "serve others" is to take money and other resources from some people to give it to others. Government has no money of its own, only what it can take as plunder from people who create value in the world. When they do so, they may actually be of help to those who are benefited, but the price is reducing the amount of wealth in a society, meaning there is less to go around. That's what "public service" as a politician -- as compared, for example, to a philanthropist, who uses his own money and/or skills and time to benefit others -- amounts to. Don Boudreaux -- While Kennedy didn’t choose a life of ease, he did something much worse: he chose a life of power. That choice satisfied an appetite that is far grosser, baser, and more anti-social than are any of the more private appetites that many rich people often choose to satisfy. Americans would have been much better off had Ted Kennedy spent his wealth exclusively, say, on the pursuit of sexual experiences and the building of palatial private homes in which to cavort, or to take drugs, or to engage in whatever private dissipations his wealth afforded him. Oakwood Bank, America's smallest bank, has about $3 million in total assets and about $2.13 million in total deposits (bank data here). In contrast, America's largest bank, Chase, has about $1.60 trillion of assets and almost $1 trillion of deposits, more than 500,000 times the size of Oakwood (bank data here). So far this year, there have been 81 bank failures out of 8,195 FDIC-insured institutions, or slightly fewer than 1% of all banks. 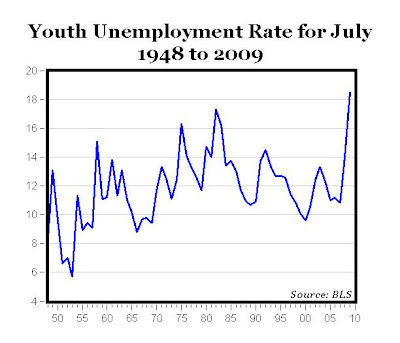 How does that compare to previous periods of financial stress and episodes of bank failures? 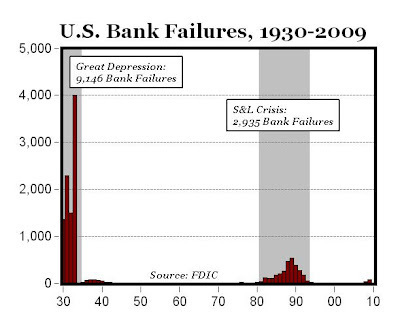 This first graph below shows annual bank failures (data here) from 1930 to 2009, showing the two most serious banking crises, the Great Depression (9,146 bank failures) and the S&L Crisis (2,935 bank failures). 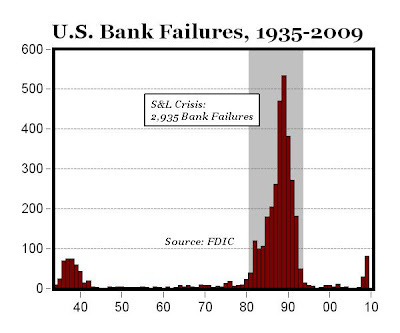 This chart shows bank failures from 1935 to 2009, and puts the 81 bank failures this year in perspective in comparison to the S&L crisis and the second half of the Great Depression. 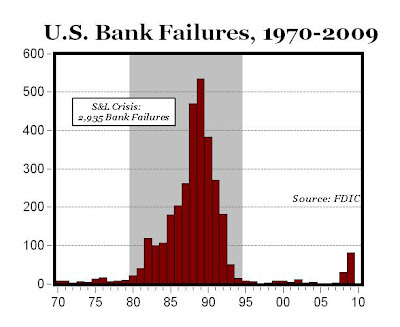 This chart below shows bank failures since 1970, and puts some further perspective on the 81 bank failures this year, compared to the S&L crisis. Caveat: This analysis simply shows the number of bank failures per year, and could obviously be supplemented with data on the number and size of bank failures. 1. Mobile phones replace alarm clocks. 2. 158 million U.S. Internet users watched online video in July, the largest audience ever recorded. Online video reached another all-time high in July with a total of 21.4 billion videos viewed during the month. 3. Toyota to Close Union Plant in California, the first time Toyota has ever closed a U.S. plant. 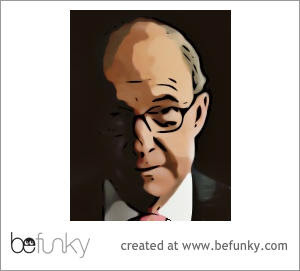 Create free cartoons from your photos at BeFunky. Michael Lynch, NY Times -- In the end, perhaps the most misleading claim of the peak-oil advocates is that the earth was endowed with only 2 trillion barrels of “recoverable” oil. Actually, the consensus among geologists is that there are some 10 trillion barrels out there. A century ago, only 10% of it was considered recoverable, but improvements in technology should allow us to recover some 35% — another 2.5 trillion barrels — in an economically viable way. And this doesn’t even include such potential sources as tar sands, which in time we may be able to efficiently tap. This is not to say that we shouldn’t keep looking for other cost-effective, low-pollution energy sources — why not broaden our options? But we can’t let the false threat of disappearing oil lead the government to throw money away on harebrained renewable energy schemes (see WSJ article below) or impose unnecessary and expensive conservation measures on a public already struggling through tough economic times. Wall Street Journal -- The biofuels revolution that promised to reduce America's dependence on foreign oil is fizzling out. Two-thirds of U.S. biodiesel production capacity now sits unused, reports the National Biodiesel Board. Biodiesel, a crucial part of government efforts to develop alternative fuels for trucks and factories, has been hit hard by the recession and falling oil prices. The global credit crisis, a glut of capacity, lower oil prices and delayed government rules changes on fuel mixes are threatening the viability of two of the three main biofuel sectors -- biodiesel and next-generation fuels derived from feedstocks other than food. Ethanol, the largest biofuel sector, is also in financial trouble, although longstanding government support will likely protect it. CHICAGO TRIBUNE -- The University of Michigan-Flint is launching an online doctoral program in nursing this fall. The university says the nurse practitioners it trains will be able to assess and manage medical and nursing problems in a variety of specialties and settings. It says the new degree program is a response to a looming shortage of nurses and doctors. The four-year Doctor of Nursing Practice (DNP) program is aimed at skills needed for advanced nursing practice in primary health care. And what does the AMA think about the DNP alternative to a "looming shortage of nurses and doctors?" Delegates at the recent annual meeting of the AMA left little room for doubt when it came to their views on the appropriate role of nurses in patients' medical care. Although nurses -- including those with a terminal degree in nursing -- are welcomed as part of the medical team, physicians still need to take the lead. Despite strongly worded opposition from national nursing organization representatives who attended the meeting, the delegates adopted a resolution that called for new AMA policy stipulating that doctors of nursing practice, or DNPs, "must practice as part of a medical team under the supervision of a licensed physician who has final authority and responsibility for the patient." The delegates further directed the AMA to oppose a recent move by the National Board of Medical Examiners, or NBME, which earlier this spring announced it would develop and administer a certification exam for graduates of DNP programs. 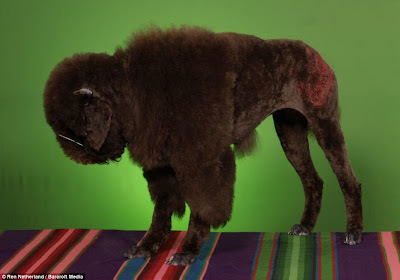 DailyMail -- They may resemble pandas, buffalos and camels - but these animals are actually poodles, all competing for the title of top dog at 'creative grooming' shows across the U.S. The top chart above shows that spending on lobbying in the U.S. more than doubled between 2000 ($1.56 billion) and 2008 ($3.30 billion), according to the searchable lobbying database of OpenSecrets.org. The bottom chart shows the top 20 organizations that spent the most on lobbying between 1998-2009. One of the indirect, and often hidden costs of increased government spending, changes in tax policy, or increased government regulation, or even the potential for increased government regulation of industries (pharmaceuticals, health care) or higher taxes (windfall oil profits tax), or the threat of deregulation of industries controlled by trade groups like the AMA, is the cost of potentially wasteful "rent seeking," aka lobbying. From the list of top lobbying spenders, it looks a lot like the industries and companies that had the most to gain or lose from government action (health care, real estate, mortgage, GM, and Exxon) over the last ten years spent the most on lobbying to influence legislation in their favor. Maybe it's also the case that some of the most heavily regulated industries (health care, health insurance, oil, telecommunications, real estate) spend the most on lobbying. For example, in the largely unregulated high-tech sector, large industry leaders spent relatively small amounts on lobbying in 2008: Dell Computer ($160,000), eBay ($2 million), Amazon ($1.3 million), Google ($2.8 million) and Yahoo! 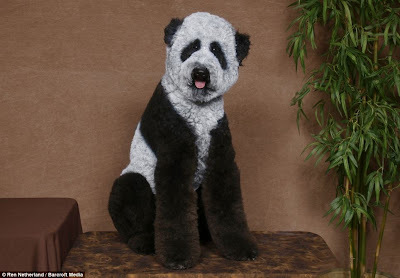 ($2.35 million). Compare those amounts to the heavily regulated and heavily taxed Exxon, which spent $29 million on lobbying in 2008, or more than 10 times more than Google or Yahoo! 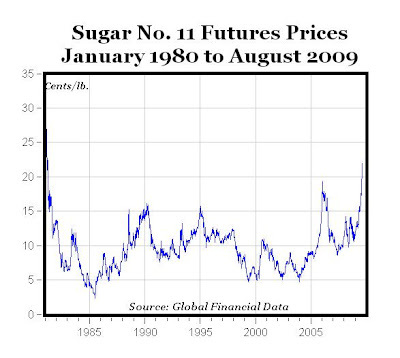 The chart above displays refined sugar prices (cents per pound) using annual data from the USDA for a) U.S. wholesale refined beet sugar price at Midwest markets and b) the world refined sugar price. Due to trade restrictions on imported sugar coming into the U.S. at the world price, the U.S. sugar beet producers have a sweet deal, assisted by their government enablers, who protect them from more efficient foreign sugar growers who can produce cane sugar in Central America, Africa and the Caribbean at half the cost of beet sugar in Minnesota and Michigan. 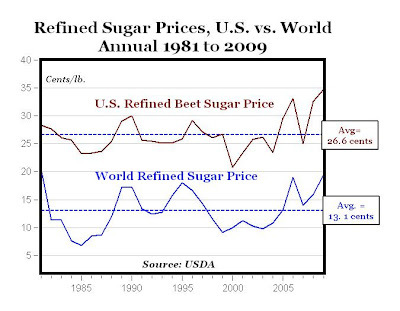 Of course, there's no free lunch, and this sweet trade protection comes at the expense of American consumers and U.S. sugar-using businesses, who pay twice the world price of sugar on average (26.6 cents for domestic sugar from beets vs. 13.1 cents for sugar from cane, see chart). The cost of most trade protection is largely invisible, but the cost of sugar protection is directly visible and measurable, since the USDA and the futures markets regularly report prices for both domestic sugar and world sugar. WIRED.COM -- Kaiser Permanente has long relied on a simple strategy of building complete, self-sustaining hospitals—employing 50 doctors or more—in each region it serves. "It's an efficient model," says Michele Flanagin, Kaiser's vice president of delivery systems strategy. "It offers one-stop shopping: pharmacy and radiology and everything you want from health care in one building." But that approach forces patients who don't live near a hospital to drive a long way for even the most routine doctor's appointment. What they found is that the system performed very well. Two doctors working out of a microclinic could meet 80% of a typical patient's needs. With a hi-def video conferencing add-on, members could even link to a nearby hospital for a quick consult with a specialist. Patients would still need to travel to a full-size facility for major trauma, surgery, or access to expensive diagnostic equipment, but those are situations that arise infrequently. Flanagin believes these clinics will enable Kaiser to add thousands of new members. And they'll do it for less. The per-member cost at a microclinic is roughly half that of a full Kaiser hospital. The first microclinic is set to open in Hawaii early next year. MP: Would we get this type of cost-saving innovation under government-run health care? WASH POST -- Builders have made huge strides in whittling away at the over supply of homes, which is key to regaining their footing in the market. The builders have instituted dramatic cutbacks in home construction, either voluntarily or because they were forced to after their financing was cut off. 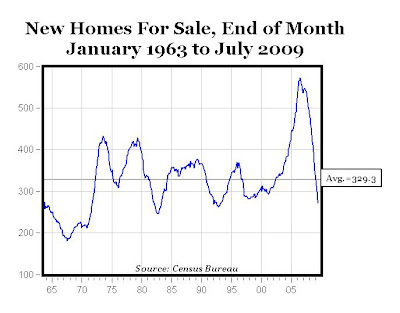 The end result is that the raw number of new homes for sale at the end of July was 271,000, the lowest reading since March 1993 (see chart above). MP: The new homes for sale at the end of July (271,000) is less than half of the peak levels in 2007, and are even below the average since 1963 of 329,300. One more sign of a significant correction in the real estate market, and further evidence that the recession is ending. WASHINGTON/WSJ -- New-home sales climbed more than anticipated in July, staging their fourth straight month of strong gains to add to evidence that the housing market is emerging from its long slump. Sales of single-family homes increased by 9.6% to a seasonally adjusted annual rate of 433,000 compared to the prior month, the Commerce Department said Wednesday. That was the highest number sold since September 2008 and well above projections for a 1.6% gain to 390,000 by economists surveyed by Dow Jones Newswires. The increase was the fifth in seven months, as buyers are returning to the market in search of bargains. The market for new homes appears to have bottomed in January, when sales hit 329,000 (see chart above). 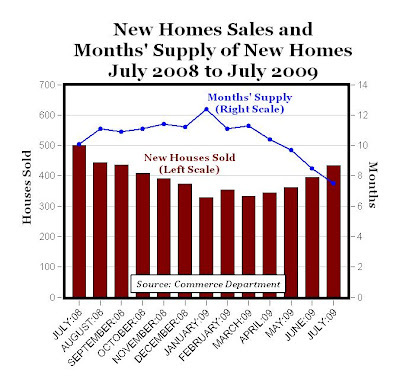 MP: Commerce also reported that the supply of new homes fell in July to 7.5 months, the lowest inventory of new homes in more than a year (see chart above), and almost 5 months below January's peak reading of 12.4 months, providing more evidence that the real estate slump is ending. BUSINESS INSURANCE -- When Scarborough, Maine-based supermarket chain Hannaford Bros. announced last year that it would begin sending its employees to Singapore for knee and hip replacements to save the company money, it attracted the attention of several hospitals in Boston that offered to match the price. What the company probably did not realize at the time was that it was at the forefront of an emerging market: domestic medical tourism. Unlike foreign medical tourism, patients don't leave the country. Instead, they travel to another city within the United States to have procedures for up to 75% less than they would pay if they were treated closer to home. One of the primary reasons some U.S. medical facilities are willing to be paid less is that they are generally compensated upfront, before the procedures are conducted, which enables them to avoid the arduous task of seeking reimbursement afterward from insurers and third-party administrators. The facilities also receive a single package price that is negotiated beforehand. MP: Market competition is a wonderful antidote to rising medical care costs. Even if there's no interstate competition for health insurance (see related CD post), there appears to be a growing market for interstate hospital care. Investor's Business Daily -- Health savings accounts (HSAs) are still alive and growing. Not only that, they seem to be working as planned. From 2007 to 2008, the total cost of premiums and employer cash contributions to HSAs rose by 2.3% for family coverage, less than half the 4.7% rise in premiums for family coverage overall. HSA-linked coverage is also much cheaper than conventional plans. Its average annual total costs to employers and employees, according to Kaiser, were $10,623 for a family plan in 2008 vs. $12,680 for all family plans. This alone means HSAs would help hold overall premium costs down if they continue to get a larger market share. HSAs reward consumers for price-conscious decisions by giving them a tax-sheltered account to salt away the money they save. Patients get a little richer by choosing generics over brand-name drugs and staying alert to overbilling. Where there's rationing — in the sense of deciding whether this procedure or that drug is worth the cost — it's the patients themselves who make that call. This is true reform because it fundamentally changes the way people pay for health care. The role of the third-party payer shrinks, and medicine starts returning to what it once was: a two-way relationship between patients and providers. 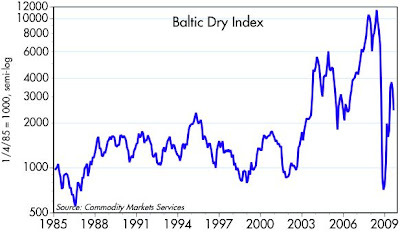 A loyal CD reader has been "jonesing" for an update on the Baltic Dry Index and Scott Grannis provides an excellent "fix," and also reports on several other shipping indexes. 1. The variability of male math test scores (standard deviation of 118) was significantly higher than the variability of female math test scores (standard deviation of 112). 2. For math test scores above 700, males outnumbered females by a ratio slightly greater than 2:1 (8.7% of males vs. 4.32% of females scored above 700). 3. Females have higher overall GPAs than males, 3.39 vs. 3.24, and females outnumber males at the highest GPAs: more than 60% of students with GPAs equivalent to A and A+ are female. 4. For mathematics courses only, female and male students both have average GPAs of 3.14. 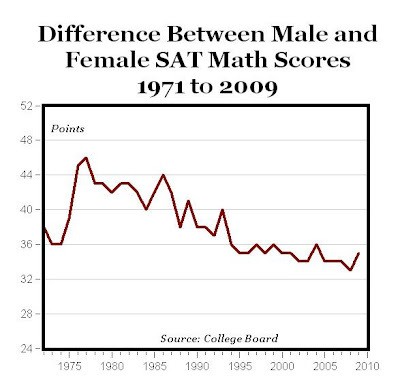 Bottom Line: Based on both overall GPAs and GPAs for math courses, we would expect female students to perform as well as, or better than, males on the math SAT exam, and yet we find exactly the opposite: a gender gap on the math exam in favor of males that persists over time. 2009 Math Camp Syllabus, topics include linear algebra (lecture notes), real analysis (notes), calculus with one variable (notes), multivariate calculus (notes), convex analysis (notes), optimal control theory (notes), and dynamic programming (notes). Main website for Yale's Economics Ph.D. Summer Math Camp. The 20-minute video above (direct link here) features a diverse group of writers whose wide-ranging intellectual and political vantage points were recorded during the first-ever Economics Bloggers Forum hosted early this year by the Kauffman Foundation. "The piece highlights some of America’s top economics bloggers, including professional and academic Ph.D. economists and journalists who have built loyal Web audiences by offering in-depth economic analysis and provocative commentary." MP: I make several brief appearances between 15:00 and 16:00. 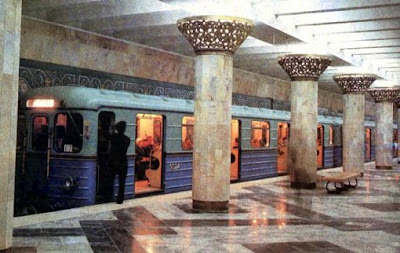 Despite the restrictions, some fearless Wikipedians and flickr users have taken some beautiful pictures of metro systems all across the former Soviet Union, and Treehugger has put them together into a gorgeous (and informative) slide show (see samples above). 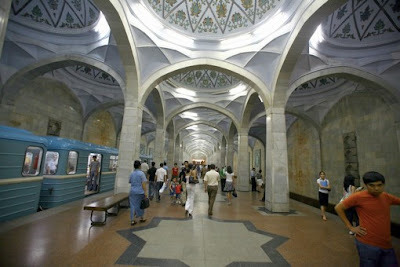 MP: For some stats on the Moscow subway system, see Wikipedia listing here, e.g. daily ridership of 7 million, 177 stations, 12 lines. Especially compared to the U.S., the Russia metro stations are more like museums, basilicas or churches than grimy, subway stations, with marble, chandeliers, columns, and stained glass. WASHINGTON POST -- Down on the farm, the latest dispute pits America's sugar producers against their biggest customers: food manufacturers that add the sweetener to everything from raisin bran to raspberry yogurt. The food makers are unhappy with a recent tightening of supplies that has pushed the wholesale price of refined sugar to 35 cents per pound (see sugar futures prices above at 28-year highs). Warning of higher grocery prices and lost jobs, the manufacturers want Agriculture Secretary Tom Vilsack to allow more imports. Domestic sugar growers insist that supplies are adequate, thanks in part to imports of Mexican raw sugar to U.S. refineries, which were allowed on a tariff-free basis for the first time last year as part of the North American Free Trade Agreement. Since 1982, domestic sugar producers have lobbied for, and gotten, a government-guaranteed share of the market. Today, their guaranteed share is up to 85%; the rest gets divided up among some 40 countries lucky enough to hold quotas of varying sizes. The advent of free Mexican imports upset this scheme somewhat, which is why the 2008 farm bill promised that the government would offset them by purchasing excess U.S. sugar and shipping it to ethanol factories. In addition, the federal government guarantees minimum prices for both raw cane sugar and refined beet sugar. Pretty sweet. To be sure, the various sugar programs don't involve the huge direct outlays of taxpayer money that other farm supports do. In a way, though, they're even worse, since the blatant protectionism operates as a non-transparent tax on every product that uses sugar as an input. Free trade in sugar would bring short-term disruptions for domestic refineries and the growers who own them but, ultimately, greater efficiency and fairness for U.S. consumers and our trading partners. Alas, we're probably stuck with the status quo -- and the wasteful inter-industry political battles it engenders -- at least until Congress writes a new farm bill in about four years. MP: Couldn't we apply our current energy policy to sugar, and significantly restrict domestic sugar production and open up our borders to lower-priced world sugar?